Layered Twenty-Hour Apple and Raspberry Crumble - Do You Know The Muffin Man? Notes: I wanted to make a dessert for someone who likes apples and raspberries and came up with this. The apple component is Hermé's Twenty Hour Apples (10 hour bake in a very low oven, followed by a 10 hour refrigeration) which I made from organic Granny Smith apples (just under four pounds) and zest from a blood orange. For the raspberries, I simmered frozen raspberries with red wine, maple syrup, a vanilla bean, cinnamon and sugar, thickened with cornstarch. 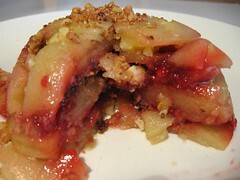 The crumble was made using leftover pie dough combined with some crushed apple granola bars. Overall, it's a nice combination of tart/sweet (the apples are more tart than the berries!) and soft/crunch. The twenty-hour apples weren't as ethereal as I had hoped for: there are nuggets of solid flavourless butter here and there, and the slices were soft but not meltingly so. Still, they are infused with flavour.